Another major goal for these outdoor spaces was to sustainably integrate stormwater collection, cleansing, and infiltration. Due to the steep topography and the potentially great amounts of rain water running off the roof and parking surfaces, many stepped stormwater treatment gardens were incorporated into the landscape. The landscape design highlights these stormwater systems by placing them along prominent walks and social spaces in the landscape. One of the more prominent stormwater systems is featured in the south courtyard. Downspouts direct water from the roof into a blackened stainless-steel “splash box” of river stone. From there, the water is conveyed through a runnel at the end of the terrace and exits through a “flume” into a series of stormwater garden planters. Here water infiltrates the soil of the stormwater garden planters, which are filled with plants such as irises and soft rushes that help with cleansing. 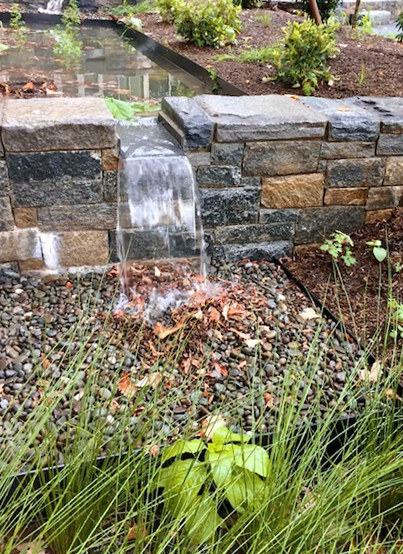 As water fills one stormwater garden planter, it spills into the next through scuppers in the stone walls. After large rainfalls, the effect is a series of small waterfalls. This system was recently seen in action after a large summer rainfall in August. Water continues to flow and animate the landscape long after major rain events. Stormwater gardens such as these help the school meet their sustainability goals while also providing unique environments that can be enjoyed from both outdoor and interior spaces. 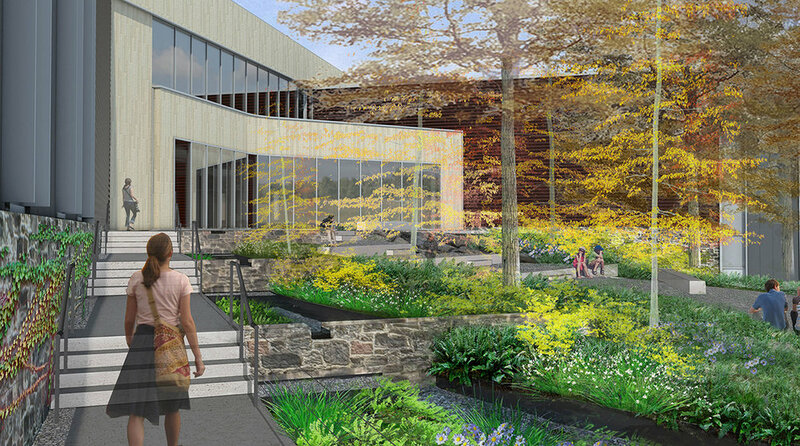 As the plantings mature, the forest will feel continuous from the two courtyards through the building. 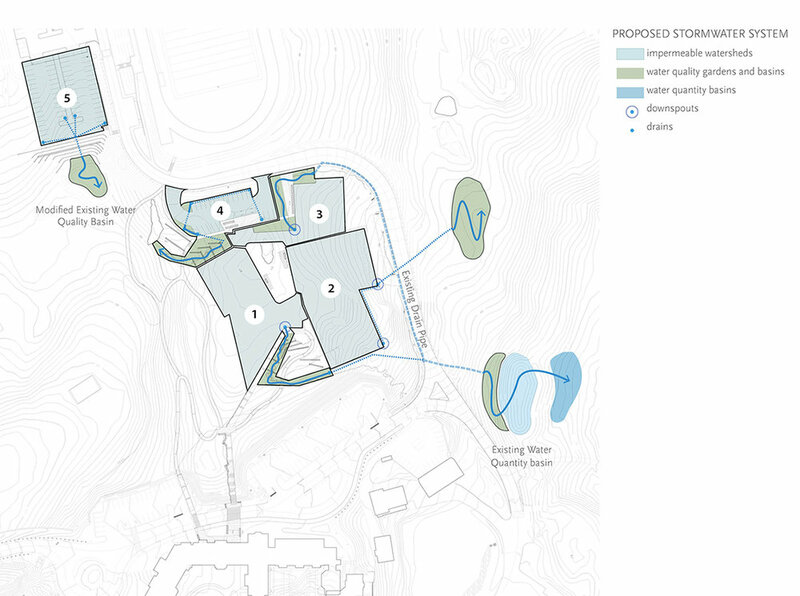 The end result is a building and landscape with a balance of indoor and outdoor spaces that honor the history of the preexisting site, as well as the Hackley campus as a whole.